Observation - Bees out of the hive - UK and Ireland. 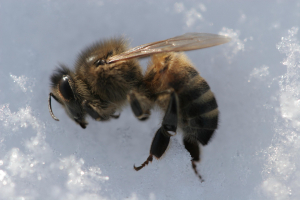 Description: I found 10s of dead and dying bees yesterday on top of some fresh overnight snow. Anyone else seen anything like this/potential explanations? I found 10s of dead and dying bees yesterday on top of some fresh overnight snow. Anyone else seen anything like this/potential explanations?